Hear Paul Gilbert's New Song, "Havin' It"
The six-string maestro's new album, 'Behold Electric Guitar,' will arrive May 17. 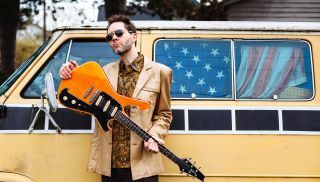 Last May, Paul Gilbert announced a new album, Behold Electric Guitar. Though initially set for release in September 2018 through PledgeMusic, only contributors received the album at that time. Now though, Gilbert has announced that the album will arrive worldwide May 17 via Music Theories Recordings / Mascot Label Group. In addition, the six-string-maestro also premiered the music video for the album's first single, "Havin' It." You can check out the video—which was directed by Jon Meyer—below. "I finally wrote a song with long guitar solos!," Gilbert said of the track in a press release. "It took me decades to stretch beyond my pop song structure habits, and it feels great to be free, and just play, and play and play. The song still has melodies and themes, and those were inspired by the idea that when you have something good, you still want more. Havin' it don't make me stop wantin' it!" Behold Electric Guitar features Brian Foxworth on drums, Asher Fulero on keyboards and New Orleans legend Roland Guerin on bass. Due to his expertise in "one mic" recording, and his stellar track record with artists like Joe Satriani, Gilbert chose John Cuniberti to produce the album. "It's so easy to make albums with overdubbing and editing these days, but I really prefer playing live and just getting the music to sound right because the musicians, the songs and the performances are good," Gilbert said. "There is not one overdub on the record," he continued. "Everything you hear is four guys jamming, listening to each other and making room for each other. The music almost mixes itself that way! And it's just a great mindset to have. When you know that you won't be fixing or adding parts later, it keeps your mind very active to get things right." You can check out the album art and tracklist for Behold Electric Guitar below. To preorder the album, step right this way. For more on Paul Gilbert, follow along on Facebook.